“Its simplicity is its charm” is a phrase that sums up The Beach House perfectly. It is located in the laid-back fishing village of Castara and situated on the north shore of the Caribbean island of Tobago. Designed and built to fit in with its beautiful natural surroundings, it encompasses stunning sea views from each apartment effortlessly. 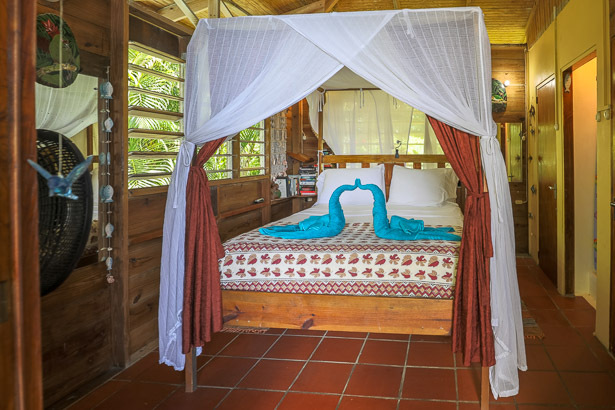 The Beach House is made up of three apartments: Coconut Heights, Palm Corner and Breadfruit Grove. Coconut Heights is comprised of the entire upper floor of The Beach House. It is a spacious one bedroom apartment with a queen sized four poster bed with a fitted mosquito net. There is an en-suite bathroom with hot water shower and separate toilet. The bedroom has double doors opening out onto a large balcony from which there are stunning views of the beach, bay and surrounding mountains. An electric standing fan is provided for ventilation, although the apartment is also cooled by the breezes coming straight off the sea. There is a fully fitted, well equipped kitchen with oven and hob, toaster oven, large family fridge/freezer, and plenty of work surface and storage space. The kitchen opens out onto a large dining area with seating for 6 people or more. The balcony area extends over the whole of the front of the house and has comfortable chairs and a hammock for your enjoyment. A high roof adds to its luxuriously open and airy feeling. Coconut Heights has a distinct homely feel with family photographs and personal touches throughout the apartment, as well as Tiffany lamps and wind chimes, and is beautifully designed to capture the spectacular views of the Caribbean Sea from each room. Palm Corner and Breadfruit Grove are almost identical self-contained studio apartments alongside one another at beach level, each with its own separate entrance. Their individual verandas can be interconnected to allow access to both units, if desired. Each apartment has a queen sized bed with fitted mosquito net and an electric standing fan. The well-equipped kitchenette has a gas hob and oven, toaster oven and full sized fridge/freezer. There is a separate bathroom. The apartments are fully plumbed for both hot and cold water. The balcony area has a table and chairs with seating for four people with spectacular views over the sea. There is a hammock in each apartment for your added enjoyment. Each apartment features a private deck with own covered barbecue area and additional seating to enhance your outdoor experience. Our apartments are especially designed for use by couples. Unfortunately there are no facilities for additional guests. We are fortunate enough to have an excellent local manager, Porridge, who lives nearby. He will look after you during your stay and will advise and deal with any issues you may have. Airport Transfers: We can arrange for you to be collected at the airport on arrival by our manager, Porridge. This costs $300 TT dollars per couple and includes a stop off at a small supermarket en route to Castara. It is a great opportunity for you to meet Porridge and a very enjoyable introduction to Tobago, Castara and The Beach House. Car Rental: Porridge can arrange car or jeep rental for you at competitive rates. If you know in advance that you’d like to explore the island, please mention car rental when you make your apartment reservation, or you can ask Porridge on arrival. Maid/Laundry service: We provide bed linen and bathroom towels which are changed every 3 days (once during a one week stay). We would appreciate it if you bring your own towels for use on the beach. If you require additional laundry or cleaning, this can be arranged via Jeanell (Porridge’s wife) for a small fee. Cooking: The kitchen is fully equipped for you to be able to cook for yourself. However, if you would like in-house catering, please talk to Jeanell as she can either cook for you herself or arrange for someone else to prepare a meal for you. Please see the General Information page for details of eating out options in Castara.